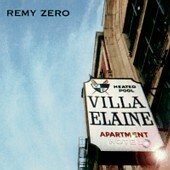 Citing Radiohead, Michael Stipe and Courtney Love amongst their fans, Remy Zero unveil their debut album Villa Elaine after already becoming a big hit on the touring circuit. And when NME compare them to the likes of REM, The Smiths and Manic Street Preachers, you know that the Alabama fivesome are going to be well worth a listen. Named after a New York apartment block that at one time or another housed the likes of Munroe, Sinatra, Welles and Ray, Villa Elaine gets of to a pretty slow and uninspiring start, as you would expect when considering the above alter-egos. "Hermes Bird" allows us a sneak preview of Cinjun Tate's whirringly delightful vocals and lyrics, and "Life In Rain" shows us the obvious depth that this band can achieve. But you have to wait until "Hollow" before the real quality stuff kicks in, and then glide on a crest of cool guitars and until the peak is reached with the gentile "Fair." For 50 seconds of sheer comedy, try "Goodbye Little World", which has an intro sounding more like John Shuttleworth than Pigeons In Flight. it's a neat little album, and you'd be well advised to try it out one day soon. The band played a one-off gig in London last May, but will soon return to dazzle summer festivals and star at headline dates throughout the year.